I am sitting on the boat at night in the small harbour at Jayapura where the lights of the bay spread up the hill. It is not quiet, though I would imagine that many locals will be sleeping. It is the last week of Ramadam and the largely Muslim population cannot eat or drink between 5am and 6pm. They get up at 4 in the morning to eat before their day of fasting begins. In every town in Indonesia and Malaysia that we have anchored in over the past year, the sounds of the mosque or 'masjid' have been our companions. Each mosque is surrounded by its own village, and each town has any number of mosques. Each of them has a number of loud-speakers fixed to the roof and the imam's call to prayer rings out every four hours through the day and night. There have been many nights when we've woken at four to this call and though Scott grumbles about being woken, I think that the sound of the mosque's song will be something that I will miss. When I am lying awake in the early hours, the sound is exotic and reminds me of how far from home we are. I have no religion of my own but I like the idea of people rising to devotion because they have been called – the people of the village going together to worship. The other songs that come across the water at night are those of another kind of song. In each country that we've visited, karaoke is a serious business. Amateur Indonesian Aretha Franklins and Frank Sinatras gather at restaurants to sing. We've eaten in a few restaurants here in Jayapura and each of them has a karaoke stage set up, so we've had some interesting entertainment whilst we eat our noodles. We are checking the weather and waiting for the right day to head North East towards the Ninigo Islands, a couple of days' sailing. 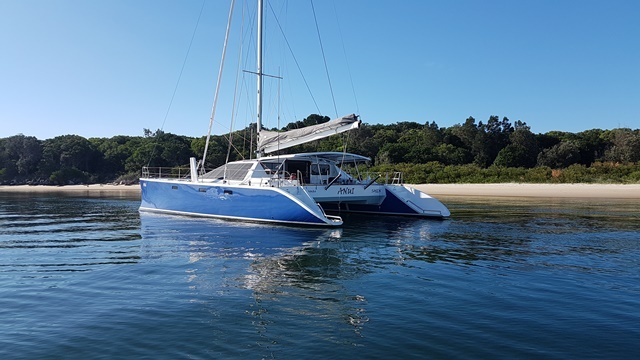 As we probably won't be able to buy fuel very easily in PNG as we'll be avoiding main towns, we have to conserve diesel so will have to – shock horror – even do some up-wind sailing where possible. Will hope to find internet at Kavieng in a couple of weeks' time. I have dragged what feels like hundred of kilos of food onto the boat – sacks of potatoes and rice, watermelons, cabbages and a whole basket of onions and garlic. These have been bought from the local markets, which take place mostly at night. Today I had my hair cut at a salon run by a transvestite and staffed by an army of nice gay guys who made a fuss of me, gave me a great shoulder massage and were keen to practice their English – learnt entirely from listening to Radio Australia. They also pronounced that 'your husband is SO handsome!' I really need to get Scott out of Indonesia. Jayapura's harbour is filthy and the sewer empties directly into it. Everyone throws their rubbish straight into the water and at low tide the bay is a mess of plastic bottles, every kind of discarded item and slimy stuff that we don't want to identify. The family that we have been befriended by live right on the water in the photo. Their house is spotless but they live with the filthy river splashing next to their walls and rubbish drifting against their makeshift walkway. They are part of the village community surrounding the mosque, with a maze of neat swept laneways overhung by baskets of flowers and drying washing. They are the kindest people, who have helped us in countless ways over the past week. School work has to happen some time - a small price to pay for the fabulous 'school grounds' the boys have enjoyed over the last 18 months! It must be good to see some friendly faces after the last little while. With all the supplies on board you'll be able to have a relaxed trip to PNG - even if it is up wind! Time for some 'clean scene' of fresh beaches and deserted anchorages....take care. Wow what an amazing journey and it's been great reading up in Multihull World.